a novel idea…fun, fashionable denim! We belles appreciate and adore that denim has become fully embraced as a uniform for day, night and everything in between. We love the skinnies, the cropped, the high-waisted, the boyfriend, the straight leg and the bell (of course). We swoon over dark wash, light wash, coated, colored and printed. Thank you, world, for making denim a fun, fashionable workhorse for our wardrobes!! This season’s trend toward the novelty jean has us whistling Dixie!! We are smitten with two in particular…so much so that we had to buy both! We are confident that they are going to be in continuous rotation for the foreseeable future. 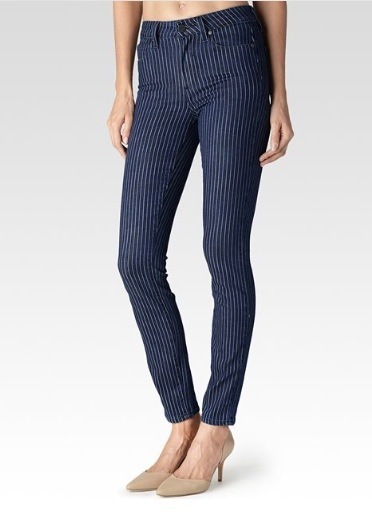 First, the Paige Hoxton indigo pinstripe. A dark wash with a higher-waist, it makes bending over a non-issue! This denim can be sporty-casual with a tee or tank, but can easily be stepped up a notch with a leather jacket or blazer and some heels…or throw in a pop of color…be creative, belles! Available online from Paige or from one of our favorite local retailers, Savvy, here. James jeans is always a go-to denim for us and they never disappoint. 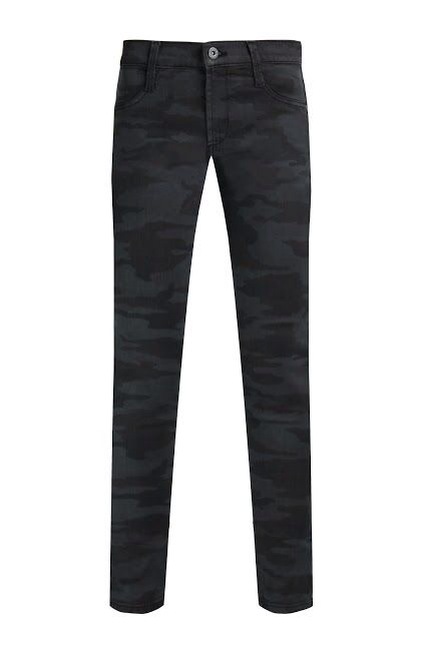 We just fell out over these camouflage jeans!! Again, dress them up or down and even play around with pattern…they look really cute with a black and white striped top! Also available at Savvy as well as online from James Jeans. They are called the “espionage”…the name alone makes us want them!! Fun, fashionable, denim in so many prints…what a novel idea! !